Raw chilled milk is received at the dairy and transferred to bulk storage. The milk may be centrifugally separated to produce skimmed or semi-skimmed milk and a cream stream. The milk is then heat treated by a variety of methods. 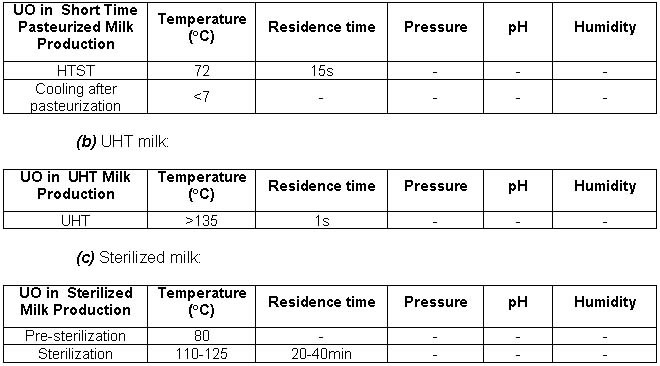 Typical parameters for HTST continuous pasteurization process is 72oC for 15sec. Hot milk is often used to partially heat incoming cold milk in a heating step known as regeneration. Following pasteurization, the milk is rapidly cooled to <7oC. Milk which is not in-container heat processed, is filled and sealed in containers under clean or aseptic conditions. Incoming milk may be homogenized after the regeneration stage, before being pasteurized. Continuous UHT at a minimum of 135oC for one second is carried out. This can be done in two different ways. Heating it indirectly, using heat exchangers, with various types of plates and pipes or in two stages, i.e. first heating the milk indirectly to approximately 80oC and then heating it directly by mixing steam and milk. The ratio of the weight of steam and milk used is approximately 1:10. If direct heating is applied immediately after the heat treatment, the milk is then cooled by expanding it under a vacuum to extract the steam mixed with the product in the sterilization phase. This is also called flash cooling. The end temperature of the milk immediately returns to its level prior to mixing with the cream. Cooling by indirect exchange with a coolant or a countercurrently with the incoming product, then follows. 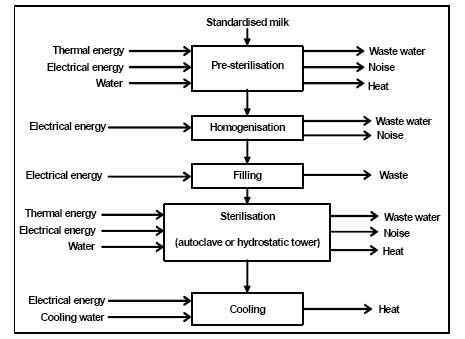 Heat treatment for long-life sterilized milk consists of two phases. The first phase is a continuous heat treatment or pre-sterilization, similar to that described for UHT treatment. The second phase consists of the final treatment of the closed container after filling and sealing the pre-sterilized product. The second heat treatment generally takes place in an autoclave in batches or in a continuous retort at approximately 110-125oC for 20-40min with an end phase of sprinkler cooling. Long-life sterilized milk and other dairy products are packaged in closed containers such as plastic or glass bottles. Pasteurization is a heat intensive process. 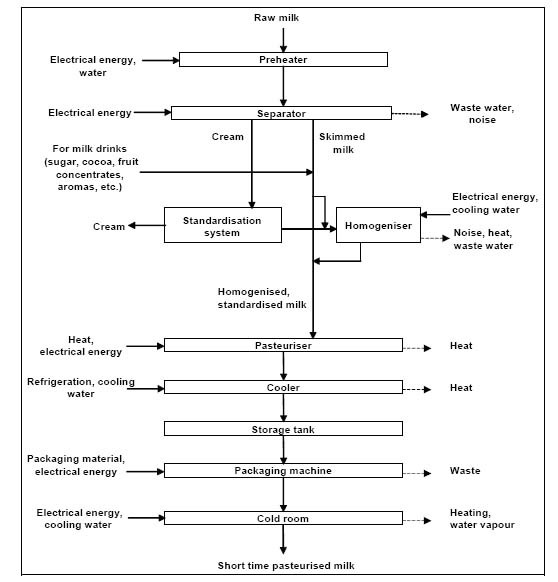 In the case of short pasteurized milk production, the temperature level of the process (~75°C) is easily reachable by using solar systems. Due to the fact that large amounts of hot water or steam may be required, auxiliary boilers can be used additionally to solar collectors (Joanneum Research). The UHT process in this case requires a minimum temperature of 135°C. To achieve these temperatures, advanced solar collector types can be used (parabolic trough collectors) and the investment cost for the solar system may increase. Due to the fact that large amounts of hot water or steam may be required, auxiliary boilers can be used additionally to solar collectors (Joanneum Research). Sterilization is a heat intensive process. 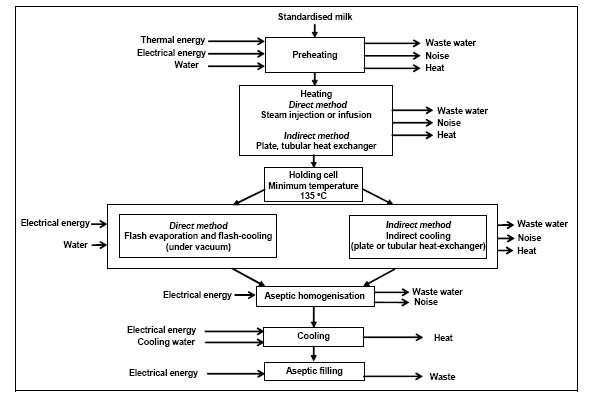 In the case of sterilized milk production, the temperature level of the process can be reachable by using solar systems. Due to the fact that large amounts of hot water or steam may be required, auxiliary boilers can be used additionally to solar collectors (Joanneum Research). This page was last modified on 21 November 2012, at 12:45.